I am always interested in the people I meet on the streets around Temple University Hospital and the Lewis Katz School of Medicine. I caught up to Joe Miller, 60, on Erie Avenue, just as he was steadying this load on his bike. Joe cruises the streets looking for things he can sell as scrap metal. He said he found these empty aluminum cases in the trash outside Temple University’s music school, and was on his way to sell them down on Hunting Park Avenue. “I guess the old horns don’t work,” he said. Cruising for scrap is only one way he makes a living, he says. “I do a lot of painting, and cut a little hair,” he adds. I watched him mount up and start pedaling. After a wobbly start on a very wide sidewalk, he steadied himself and headed west. A mother calls...and reminds me of the power of stories! This morning, I made a presentation to the chiefs and chairs at Temple University Hospital, trying to explain to them what I hope to do as director of narrative medicine, the culture of stories I hope to create at Temple Hospital and the Lewis Katz School of Medicine. Maybe I should have just told them the story of Nellie. What better way to convey the power of stories to heal, to lift people up, to provide dignity to even the frailest among us. I got a call this morning from her mother, telling me Nellie had died peacefully. Years ago, for the Inquirer, I wrote a long profile of the Rev. Elinor S. Greene _ Nellie to all who knew her. Nellie was like Katharine Hepburn in The Philadelphia Story. She lived in Chestnut Hill, attending boarding school, was beautiful and full of life and beloved with a million suitors, with a radiant smile and lively mind and irrepressible spirit and generous heart. She earned letters in five varsity sports in high school and was president of the service club and sang like an angel. On her way to Hampshire College in the 70s, she had been to a dance the night before, was asleep in the back seat, and her mother, attempting to change lanes on the highway, suddenly changed her mind, swerved back, and lost control of the car. Nellie at 18 was thrown. She suffered extensive brain damage, ruptured both lungs and her heart stopped twice on the operating table. But she not only survived, she persevered. After three years of rehabilitation, she went back to Hampshire College and graduated in four years, and then attended Yale Divinity School, where she was ordained a deacon. Serving God became her salvation, changing her life from one of misery to one of joy. But over the years, her physical abilities continued to deteriorate, and her body became a tomb to her irrepressible mind. As the years went by, she lost her speech, and her ability to walk or even stand, or swallow. She was too weak to blow out a candle, and was utterly dependent on others. She lived in a nursing home room at Cathedral Village. I met Nellie one day in 2004 at the Rocky Steps of the Philly Museum of Art, while working with Tom Gralish, who took this photo, on our book, Rocky Stories. Friends had brought Nellie there, in her wheel chair, for her to pose for her annual Christmas card photo. “Rocky wishes he could have had the strength, the inner strength, of Nellie Greene,” said one of her companions. I included Nellie in our Rocky book, but I wanted to write a longer story, a profile, and did in 2007. I will never forget watching Nellie in that nursing home room type a sermon. Her vision was blurry and her hand would shake horribly. With an impossibly shaky index finger she’d move slowly across the keyboard to strike a key, but invariably she’d strike the wrong one, and then slowly move that shaky hand back across the keyboard to hit backspace, and try again. It would literally take her four or five tries to strike the right letter _ letter after letter. It would take her five weeks, a grueling, exhausting marathon, to type 2000 words. But it was through these sermons that her clever mind and soaring spirit could connect with the outside world. A parishioner would read them to the congregation on Sunday mornings. Gradually Nellie declined further, and became entirely a prisoner in her own body, unable to communicate at all. And to those who didn’t know her, a stranger, and worse, someone without a story. Here is a link to my story on Nellie from years ago, and below that a link to my stories so far at Temple. Maryanne Wurst was holding onto her walker with one hand, and leaning over to pick up a stone in the street with the other. "I make hearts from ordinary street stones," she said. She held up the treasure she had just collected – a weary, homely rock, one of a million on the crumbling streets of North Philly. “See the vein here,” she said, pointing to a curved line in the rock. “This is going to be a beautiful heart." She may have health issues aplenty, but her vision is, well, rock-solid. She lives in senior apartment building two blocks from Temple University Hospital, and was on her way to the bank machine across from the hospital to get money for breakfast. Her Social Security check had arrived and she was taking the bus to her favorite breakfast place. She was happy to talk, but turned her walker around so she could sit on the seat. That in part may explain why she has a large ventral hernia, as well as many other health issues, but was utterly cheerful and positive. She pulled a beautiful black heart-shaped stone from a plastic case she carries. She found that stone on the street, and used a coarse piece of cement, also picked up in the street, to smooth it into the heart. She said that despite her health issues, and need to sit often on her walker, she can still run, and often does for half a block or so. Even though I urged her not to, pleaded with her not to, she was not to be denied. “Here I go,” she said, and holding firmly onto her walker ran down the street and disappeared around the corner. I hope she had a great breakfast. Shawn Lee, 54, who has survived three brain surgeries at Temple University Hospital, was motoring down the street with his nephew, Aiden Young, 4, on their way to Starbucks. Lee often lets his nephew drive. What a Moment! From fear to euphoria in a heartbeat! My latest story from Temple university hospital. Stories have the power to heal and unite and inspire. Lucy Kalanithi, widow of the best selling author of When Breath Becomes Air, came to Philly recently and I heard her speak. Since I am so interested in narrative medicine, and storytelling, I wanted to know why he wrote the book, how he wrote the book, and when he wrote the book -- literally as he was dying. His widow had to finish it. It is really powerful to see a surgeon's perspective from the other side of the bed, so to speak. In better days, before his death, surgeon Paul Kalanithi and his wife, Lucy, an internist. My former colleague Stacey Burling writes a good story today in The Philadelphia Inquirer on the latest research on physician assisted suicide -- better known among supporters as medical aid in dying or death with dignity. She interviews Ezekiel Emanuel, the Penn professor and physician, who has a long history in this issue and opposes legalizing it. The catalyst for the story is a study on the subject that ran in JAMA on Tuesday. 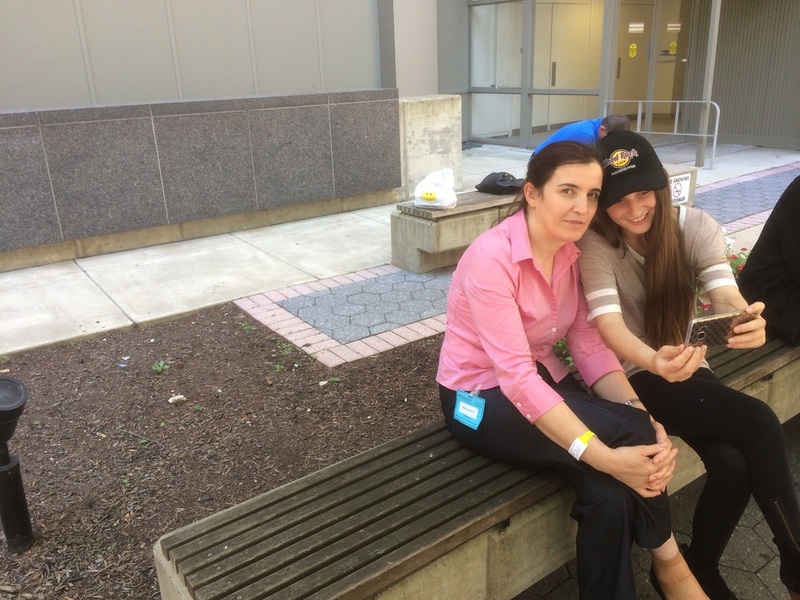 Zinete Kupa, 40, and her daughter, Mihane, 14, wait for lab results on a bench outside Temple University Hospital. To amuse themselves they send a selfie to family members back in Tirana, Albania, where they are from. 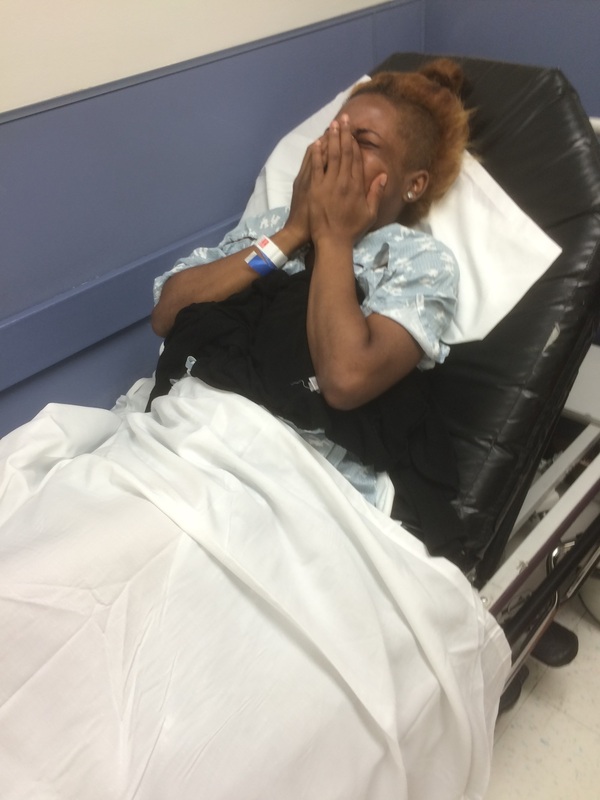 "I don't feel very good, " said Zinette, whose primary care doctor in Port Richmond sent her here for tests. Mihane, a middle child and natural caregiver in the family, came with her mother. Her dream: "to be either a fashion designer or a nurse." The family moved here years ago "for a better life." Hamit, the husband and father who works construction, was resting on another bench. They had another half hour to kill before the test results would be ready. Then they'd go back inside to find out what was wrong. People, not patients: Holding hands and holding up! Standing outside the hospital, enjoying the glorious sunshine, holding hands, Sam and Claire Zieminski looked like they had a story to tell. So I stopped and introduced myself. They came to Temple hospital this morning for her, for an endoscopy, and all was well. But he was the real medical marvel, with triple bypass surgery in 2009 and a double lung transplant here in 2012. The retired Philadelphia police officer and his wife, 71 and 70, just celebrated their 50th wedding anniversary and took a cruise. I loved their All-American look _ her red-and-white, stars-and-stripes t-shirt and his blue one. Underneath that shirt, I joked to him, I bet you’ve got scars. “Oh, he’s got a lot,” she said. “Looks like I was in a knife fight and lost,” he said. But at this moment, in life, it sure looked like he was winning. They both were. They will be having a barbecue at their Bensalem home on the Fourth of July, with kids and grandkids. .
“She was sitting sweetly, snuggled next to her two boys on the bench. She had oxygen tubing leading into her nose. But she looked young and healthy and happy. So I stopped and introduced myself, and asked her for her story. She has a beautiful name, Arileyda Amparo, and she lives in Philadelphia. She comes to Temple Hospital every six weeks to have her blood checked. She is just waiting for an appropriate set of lungs to become available. Her boys were now running circles around her bench, the energy of youth. They had gotten check-ups themselves that afternoon. I thanked her and wished her well. Their ride was here and they were gone. This is a test to see whether I am cool enough to blog from my fone! Here I am! I did it! Congratulations to my son and his new bride on their wedding day! Good luck! Welcome to the Squarespace blog of Michael Vitez.